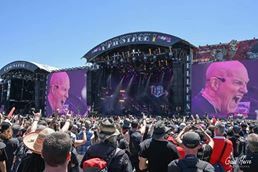 Chris Slade is a Welsh rock musician and drummer, best known for playing for the Australian hard rock band AC/DC. 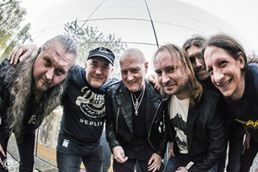 He is the current drummer for the group and previously drummed for the band from 1989 to 1994, performing on their 1990 album The Razors Edge along with their first live album with singer Brian Johnson, AC/DC Live. He returned to the band in February 2015 to replace Phil Rudd for the “Rock or Bust World Tour”. Slade has also played with Manfred Mann’s Earth Band, Tom Jones, Toomorrow, the Firm and Asia. Before setting off for a well-deserved holiday break, we had the opportunity to have a chat with the drummer from one of the world’s biggest rock bands. ANTIHERO: Like many musicians these days you have diversified with other business interests. Unlike Nicko from Maiden, who has opened a drum shop, you have done what many see as a complete departure…introducing a jewelry range. Why? And how did that interest come about? Do you have any direct input into the actual design process itself? What are your short-term and long-term goals for the range? Will fans be able to purchase items at the forthcoming live shows, or will it remain solely an online business enterprise? Chris Slade: There’s a video on www.spiritofthedrum.com that explains that I’ve always been interested in design and artwork. I went to art college for 3 years to learn to draw, sculpt and design and it was hugely rewarding. I particularly enjoyed casting bronze and that’s why I love the process of making silver jewelry. I use the American spelling of jewelry because the corporation is registered in the USA. This is a long-term project, well….as long-term as It can be, ha. ha. Pieces can only be bought online from the USA. ANTIHERO: What was your first introduction to music, and when did you decide to make drums your chosen instrument? 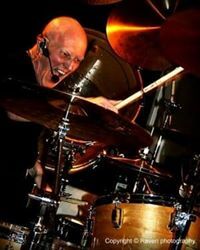 Chris Slade: I used to go to the local dance hall in the late 50’s, early 60’s, and I would see local bands as well as professional groups such as Billy J. Kramer and the Dakotas from Liverpool, but I started playing drums when I was 10 or 11 years old, taught by my older brother Danny. I always wanted to be a drummer but in the late 50’s there wasn’t a chance in hell to get a break, or so I thought. ANTIHERO: You first joined AC/DC in November 1989, how was that process? Was that a day that remains clearly in the memory? Was it just another audition given that you were already familiar with playing with musical legends? 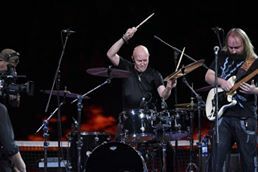 Chris Slade: I haven’t had many auditions in my life but that was one of a few, Pagey phoned and asked me to play with him and so did Gilmour, Moore, and Manfred Mann, along with just about everyone else. The AC/DC guys had no idea that I was so experienced, (I played Madison Square Gardens for a week with Tom Jones in the mid 60’s using The Count Basie Orchestra). While we were recording “Razors Edge”, Malcolm and Angus actually said, ‘we had no idea you’d been playing with other people before, we thought you were sort of starting out’. I had auditioned against 100 top, top drummers and I was the last one because they called my home phone before I had driven the hour from rehearsal place to back home. ANTIHERO: The rhythm section of a band is the heartbeat for me personally. You have played with some of the top guitarists in the world, but in your musical history who would be the best bassist that you have created music with? Chris Slade: There’s no such thing as best for any instrument there have been many great players on every instrument. How could you choose between Page, Gilmour, Moore, or Angus? All the bass players I have worked with have been great and it’s important to lock in with the bass. Without me locking with Cliff Williams, AC/DC just wouldn’t work. I recommended Pino Palladino to Gary Numan, and we worked together on Numan’s “I Assassin” album as well as touring together. I didn’t know it was Pino’s first professional gig on bass, he was a guitarist before, but I knew he was a wonderful fretless player. Tony Franklin (The Firm with Page and Paul Rodgers) is a monster player. Bob Daisley with Gary Moore. Colin Pattenden with Manfred Mann’s Earthband. Trevor Bolder with Uriah Heep, he was also of course in The Spiders of Mars. All these guys are great players but more importantly, we could work together as a rhythm section. In fact, I can’t think of a single bass player I’ve worked with that I would say I don’t want to do that again. They might think that about me though, haha. I had the great honour to jam with Jaco Pastorius in New York, just me and him, for about 15 minutes at the Brecker Brother’s club, that was an honour and an inspiration. People were shaking my hand, slapping me on the back. A crew guy said to me afterward, “I didn’t know you could play like that”, Pagey said, “I did”! I started playing, (learning, listening to) jazz in the 50’s because there weren’t many great drummers on pop records then. ANTIHERO: Did you initially feel betrayed when AC/DC brought Phil Rudd back in after you had worked on the “Ballbreaker” album demos? Did you accept willingly when they came back to you several years later, or did it require any element of soul searching? Chris Slade: Yes, and yes!!!! I’m a pretty philosophical guy but I did feel anger at that time, who wouldn’t?? In fact, I stopped playing drums completely for 3 years, that’s when I went to art college. I really didn’t expect that call to come back…I hoped but didn’t expect. ANTIHERO: You have played on many albums since you first started out in music. Do you have a personal favourite? Do you keep copies of albums that you have played on, or still listen to? What’s your favourite musical genre to play? Obviously, most of your catalogue is rock-based, but was it more personally challenging to create something like “I Assasin” with Numan, or something by Tom Jones, or Manfred Mann? Chris Slade: I think I’ve got a copy of all the albums I’ve done somewhere but I never play them…. EVER! There’s no surprises like on other people’s music. 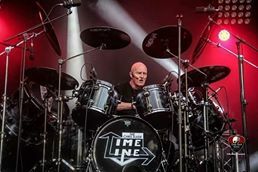 With The Chris Slade Timeline, I get the chance to play many different drumming styles because it’s a trawl through time and my career so we play from Earthband to Uriah Heep to AC/DC. Earthband was a very creative time because I was songwriting, co-producing, trying experimental ideas, jamming on stage, flying off on musical tangents, very rewarding. ANTIHERO: After playing with so many musical legends, do you still keep in touch with evolving musical trends. Can you recommend a new band that you have recently discovered or enjoy? Chris Slade: No! I still prefer stuff from the last century! I’ve heard that new group called The Beatles are pretty good! ANTIHERO: How do you look back at your career, with a sense of pride, or with a perfectionist slant – seeing mistakes that could have been avoided or prevented? Chris Slade: Yes, with pride, I’m not yet a zen-master, so I do have personal pride. To be playing with power at my age is (for me) unbelievable, I didn’t expect to be alive never mind still playing drums at my age, so I’m really looking forward to the next fifty years. ANTIHERO: I am sure that you have done many interviews over the years. If the roles were reversed and you could actually pick someone to interview, who would you choose and why? Chris Slade: Drummer Tony Williams, Physicist Steven Hawking, and Jedi Master Obi-wan Kenobi, but I’ve heard he’s a little difficult to talk to, unlike the other two. ANTIHERO: Thanks for giving me the opportunity to put these questions to you. Hoping to get the chance to chat face-to-face at your forthcoming shows in Ireland this year. Chris Slade: Thanks, some very interesting questions.